I continue updating the Dauntless versions that I am building in parallel to the basic SBD-3. In the previous post I updated the one important element of the SBD-5 model: its propeller (SBD-3 used an older version of the Hamilton Standard propeller). In this post I will continue this update. As I described it in one of my previous posts, in parallel to the SBD-3 I build a SBD-1 model and a SBD-5 model. They are in the same Blender file, but in separate scenes. Since I completed the SBD-3 model for this project stage, now it is time to take care of these other versions. These models share all the common objects with the SBD-3, so I have to recreate a few different details. I already modified their NACA cowlings. In this post I will update the SBD-1, because there is just a single remaining difference: the ventilation slot in the side panel of the engine cowling. 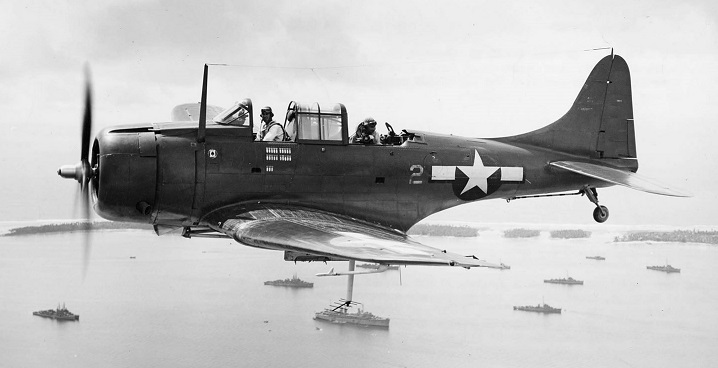 (I used here an archival photo of the SBD-2, because it had the same side cowling as the SBD-1. There were only 57 SBD-1s ever built, so the photos of this version are not as numerous as the later ones). The parts of the fuselage around the cockpit are always tricky to model. It especially applies to the panel around the windscreen. When you obtain the intersection edge of these two objects, it can reveal every error in the windscreen or the fuselage shape. I am going to split this object into individual panels, thus I already marked their future edges as “sharp” (as you can see in the figure above). It allowed me to preserve continuity of the tangent directions around these future panel borders from the very beginning. This panel had two variants. The first one (let’s call it “flat”) is visible on the photo above. It was used in the SBD-1..-4. In the SBD-5 and -6 the engine was shifted forward by 4”, so the central panel became a little bit longer (“deeper”). However, it was quickly discovered that it obscures one of the most important spots in the pilot’s field of view: straight ahead and slightly below the flight path. 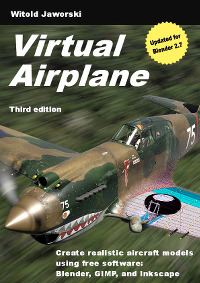 That’s why it was somewhat corrected in the next version (SBD-2). In this aircraft the designers lowered the scoop, increasing the field of view from the cockpit. Such a solution persisted in the SBD-3 and -4. In the SBD-5 they completely redesigned it, placing the carburetor scoops inside the NACA cowling (more about this — see in this post the paragraphs around Figure 11-6). The gun troughs in the aircraft usually are tricky elements. Their edges depends on the shape of two curved surfaces: the fuselage around the recess and the tubular inner surface. When you make mistake in any of these two shapes — you have to remodel the whole thing. Basically, the SBD Dauntless NACA cowling was split into a single upper panel and two symmetric side panels. I started by copying corresponding part of the reference shape (created in this post) into the single side panel (Figure 43‑1b). The subdivision surface of such a 120⁰ mesh ‘arc’ is somewhat flat at both ends. Thus I had to tweak a little mesh edges in these areas, fitting them to the reference contour. I am sure that I will tweak this shape multiple times before I reach the most probable compromise between all the reference photos I have. It will be much easier to do it by modifying a simple mesh instead of the complex topologies of the final cowling. Thus I decided to create first a simpler version of this fuselage section and adjust it to the all of the available photos. I will describe this process in this and the next post. Once this shape “stabilizes”, I will use it as the 3D reference in forming the ultimate cowling. Because I am going to recreate all the internal details of the engine compartment, I will create each cowling panel as a separate object.